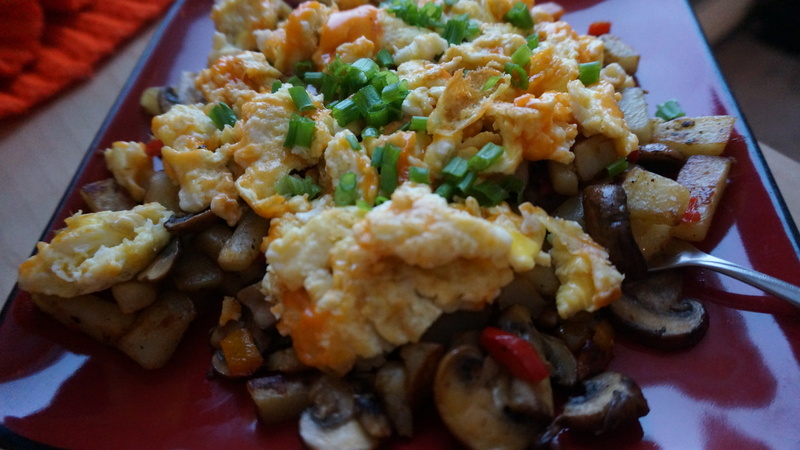 I dived into another mash up of breakfast and mushrooms again today. My favourite part of the meal was the perfectly cooked potatoes. My least favourite part was the perfectly cooked mushrooms. You see, that’s the thing. As far as sliced mushrooms lurking in most meals go, I’m finding that I can eat them. I eat a little slower – not like a ravenous wild dog which is how I usually approach dinner – and that’s probably a good thing. I am still tense during the feast and once the last shroom is gone I relax immensely. I don’t seem to be outwardly gagging and I’m beating my inner gag reflex into submission, but it’s still there.. just quieter, broken, but still there. It has a tiny voice that every once in a while drifts up out of my subconscious with a trembling whisper – why? It’s more than that though. It’s about facing a fear and working through it. It’s about strengthening the mind. It’s about fostering a belief in self. Do I hate mushrooms? Yes. Do I still hate mushrooms so far into this challenge. Mostly. The point is that you if you truly set your mind to something, you can do it. I’m taking my biggest, nastiest food aversion and I’m facing it every day. It is slowly, but surely changing my perception of mushrooms. I mostly hate mushrooms. That is a far cry from an everlasting hate, disgust and the rampant refusal of allowing mushrooms to taint any food that will enter my belly. I am learning that this aversion is very real and very much an intrinsic part of who I am, but I’m also learning that I am capable of overcoming the way that I think and experience them. It is mostly the way that I think about them that I am changing, but eventually how I experience them will change with more noticeable results as well. Read those last two sentences again. This doesn’t have to be about mushrooms. For me, right now, it is. But this can apply to anything. Read those sentences again. Think of yourself. It might be bigger than mushrooms, but whatever it is that you want to change how you think about it – just know that you can do it. It might be a battle. You might barf. But if you stick with it, you’ll make it. And you don’t actually have to be belligerent like me to do it. Just be willing to try and willing to commit to seeing it through to the end.